In 1990, the United States Congress designated March 25th, of each year, as National Medal of Honor Day, a day that is dedicated to all Medal of Honor recipients. 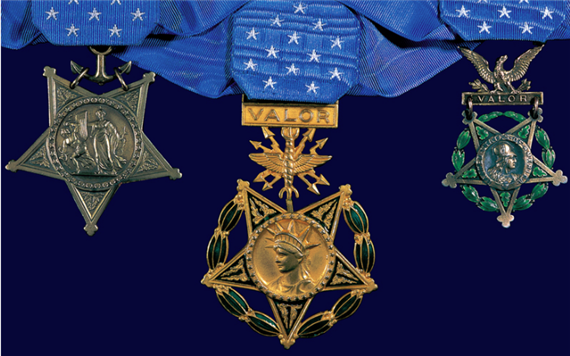 It was on March 25, 1863 when the first Medals of Honor were presented. Secretary of War, Edwin Stanton presented Medals of Honor (Army) to six members of “Andrews Raiders” for their volunteering and participation during an American Civil War raid in April of 1862. There are three versions of the Medal of Honor, one for the Army, one for the Navy and one for the Air Force, with personnel of the Marine Corps and the Coast Guard receiving the Navy version. Since its creation, there have been 3, 468 Medals of Honor awarded to the country’s soldiers, sailors, airmen, Marines and coast guardsmen.